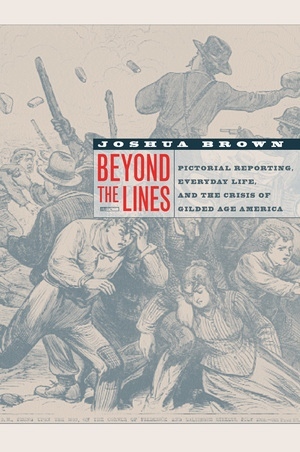 In this wonderfully illustrated book, Joshua Brown shows that the wood engravings in the illustrated newspapers of Gilded Age America were more than a quaint predecessor to our own sophisticated media. As he tells the history and traces the influence of Frank Leslie's Illustrated Newspaper, with relevant asides to Harper's Weekly, the New York Daily Graphic, and others, Brown recaptures the complexity and richness of pictorial reporting. He finds these images to be significant barometers for gauging how the general public perceived pivotal events and crises—the Civil War, Reconstruction, important labor battles, and more. This book is the best available source on the pictorial riches of Frank Leslie's newspaper and the only study to situate these images fully within the social context of Gilded Age America. Beyond the Lines illuminates the role of illustration in nineteenth-century America and gives us a new look at how the social milieu shaped the practice of illustrated journalism and was in turn shaped by it. Joshua Brown is Executive Director of the American Social History Project/Center for Media and Learning at The Graduate Center, City University of New York. He is coauthor of the interactive CD-ROMs Who Built America? From the Great War of 1914 to the Dawn of the Atomic Age (2000) and Who Built America? From the Centennial Celebration of 1876 to the Great War of 1914 (1993), and visual editor of the groundbreaking Who Built America? textbook (1990, 2000), in addition to his many other documentaries, digital programs, essays, illustrations, and cartoons.